Little Spacey v1.0.0 released - new plug-in! 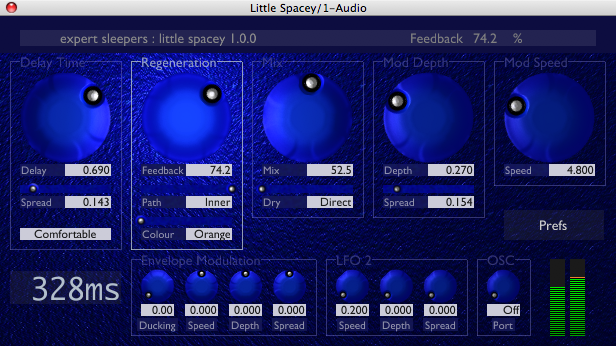 We're proud to announce the release of Little Spacey, a new plug-in for Mac OS X (AU/VST) and Windows (VST). Little Spacey is delay effect, inspired by classic analogue ‘bucket brigade’ delays but with refinements only possible in the digital arena - not to mention a maximum delay time that would cost a small fortune to realise in hardware. Great care has been taken to give Little Spacey the smooth, creamy sound which makes analogue delays still popular today. Download the free demo and user manual from the downloads page. The plug-in includes a number of presets (described in the manual) which show off the range of possibilities that the plug-in offers. Available immediately, priced at $29 (USD, plus VAT if applicable). Please read the following blog post (above this one, if you're reading on the Expert Sleepers home page) for details of how to get Little Spacey for just $5!